This may read like an attack on WC’s buddy, Glenn Bartley. It’s not. Or it may read as some kind of sneering whinge. It’s not intended to be. This post is about truth in photography, about honesty and candor. But WC is getting ahead of himself. Hummingbirds are notoriously difficult to photograph, especially in flight. With a wingbeat of 12-80 strokes per second, depending on species, freezing the motion is a serious challenge. You can do it with high speed flashes, although it can take a lot of flash units. In turn, that makes it harder to move with the bird, and hummingbirds are famously flighty. So you pretty much have to put up a feeding station. Of course, then you need a nice background, so why not put a screen behind that feeder, just make the background a soothing, soft blend of colors. And, of course, having the bird on feeder would be ugly, and just having the bird flying might be a little boring, so why not inject sugar water into a few flowers and mount them in front of your background? And that is what was going on the on deck at Tandayapa Lodge on January 7. A class in hummingbird portraiture. You can see the four flashes (wrapped in plastic baggies against the drizzle), the soothing pastel background (covered with an umbrella) and a feeder. Technically, WC supposes, it’s bird photography, in the sense that photographs are being taken and the photos are of birds. But it’s bird portraiture, not nature photography. There’s nothing wrong with it in the abstract, but it is qualitatively different than stalking and photographing a bird in a fully natural setting. You can get awesome shots; Glenn Bartley’s photo gallery is full of terrific images. His shots of a Booted Rackettail, for example, are terrific. But, really, they aren’t that different from a studio shot of your toddler, are they? Of course, this is just a point along the continuum of the Great Bird Photo Debate. At one end, you have the absolute purists, who won’t take a shot of a Black-capped Chickadee at a feeder, because the bird is baited in for the shot. At the other end is Glenn Bartley, who carefully establishes and controls each and every element of the photo. WC admits to a preference for natural shots, and a strong aversion – bordering on revulsion – to baiting raptors. But for the most part, WC regards it as a matter of disclosure. If your photos of a Tufted Puffin were taken in a marine aviary, just say so. Because if you don’t disclose, it can make everyone visiting your gallery, or examining your photos, ask the obvious question: is this shot staged? And that’s bad for all of us who photograph birds. 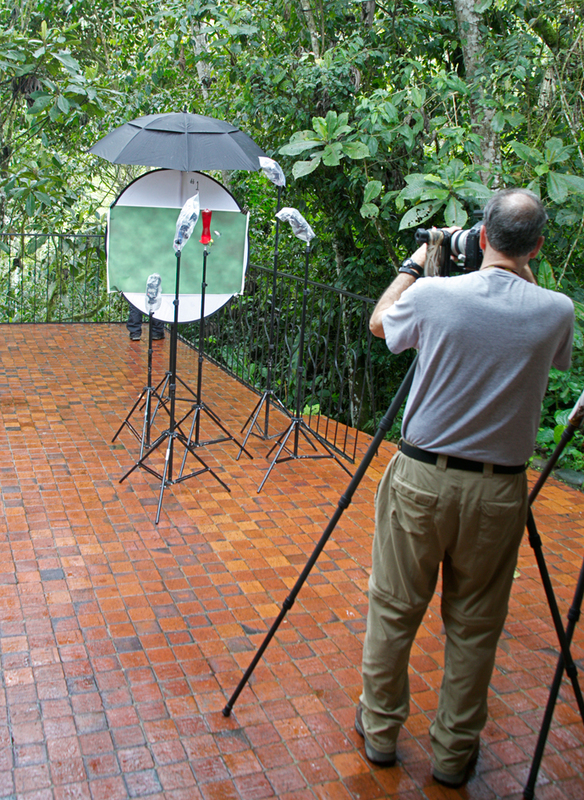 Since the photographer is being baited into taking photographs by an elaborate setup of flashes, backdrop, and baited hummingbirds, I think you should disclose that your photo is a staged portrait of a portrait photographer taking staged hummingbird portraits. Except that the portrait photographer paid good money for the instruction, more or less the obverse of baiting. Best setup I’ve seen for Hummers was neighbor who had backyard flowering bushes. Noting the blooming cycle the photographer positioned a golf ball on top of a tripod in front a ripening flower. Then 40 ft away the camera also on tripod was focused perfectly on ball. Then 2 infrared light beam switch setups (like those used with garage doors) were placed either side of ball on intersecting x and y axis. Finally the golf ball and tripod removed. The infrared switches triggered a camera remote. Only when a bird was in the exact ex golf ball sphere would it take a photo. The photographer left it unattended all day, getting some awesome pics.